I have no thoughts from my childhood on this one so there’s no waffle here today, just straight on to the recipe. This uses Gran Luchito smoked chilli paste, you only need a little, especially if throwing in a red chilli like I did. Heat the oil in a pan and add the onion, fry until softened. Add the garlic and half of the red chilli and cook for another minute. Add the paprika and cumin seeds along with the chilli paste. Stir for another minute. Add the red wine vinegar and a pinch of sugar and stir then add the tinned tomatoes. Bring to the boil, season then cook for about 15 minutes. Whilst this cooks, peel and stone the avocados and roughly chop. Add the remaining chilli, coriander and the lime juice. Roughly mash and season. Add the beans to the chilli and cook for another 10-15 minutes. Serve with the guacamole and a dollop of sour cream. I also served soft tortillas. Very tasty and made a work lunch too. Adapted from this Delicious Magazine recipe. loving this idea – am having Mexican tonight, hope there’s something like this on the menu! Thanks. I’m sure you have had your meal now and you got a nice veggy chilli? This sounds delicious! 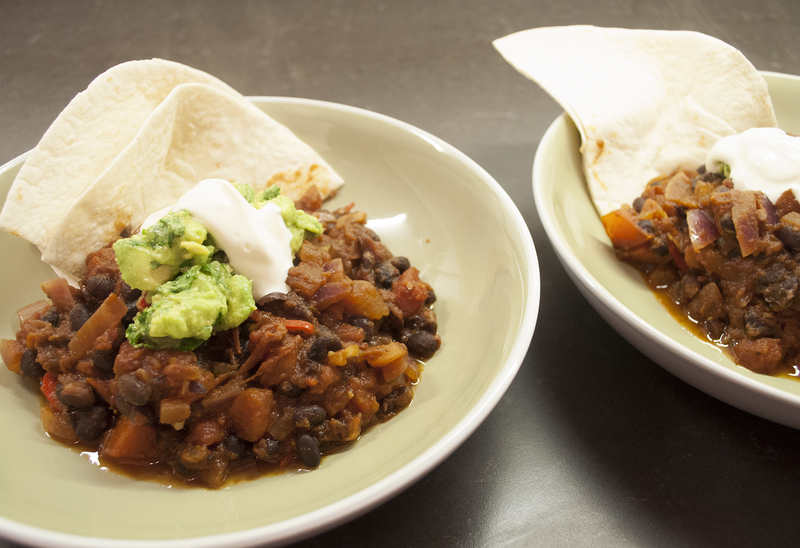 I am constantly looking for the perfect bean chilli recipe, I’ll be trying this out. I hope you enjoy. I love the smoky paste from M&S but you could def improvise or just go with the chipotle in the original.